There’s nothing like good guacamole and corn tortilla chips. The key to making it notable is a sturdy chip and never running out. Lets face it, by the time any of us get around to actually making a batch, we may as well make a bucket full and have everyone dig in! The best brand of tortilla chips we’ve found is El Milagro in the beige bag, and in a pinch Donkey brand will do. 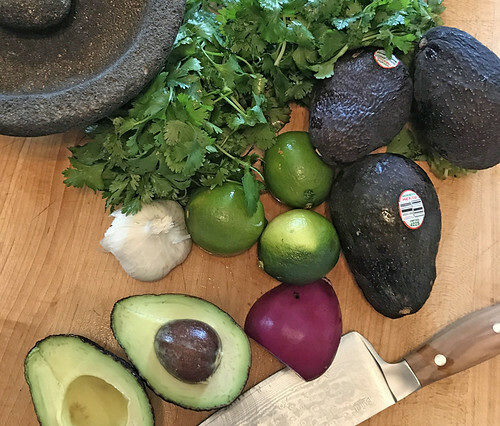 This recipe is a guide – the ingredients stay the same, but the quantities vary based on the size of the avocados and limes and my taste that day. Place in fridge and let flavors meld for an hour or more. Do you prefer your guac with a little zing?! – On occasion I will add some Salsa, and If I don’t have that I’ll add some Diced Tomatoes and Crushed Red Pepper.